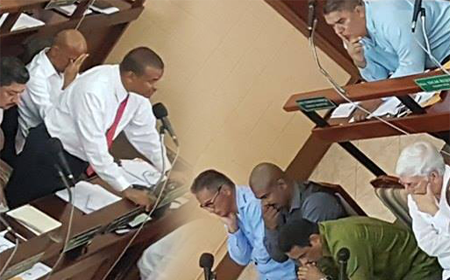 BELIZE CITY, Fri. Jan. 13, 2017–The Belize-Guatemala issue took center stage at Friday’s special sitting of the House of Representatives, the first for 2017, with both sides of the floor diametrically opposed to a move by the Barrow administration to do away with the 60% minimum voter turnout threshold from the Referendum Act—a change which comes three years after Guatemala demanded it, on the premise that the high threshold is not conducive to a ‘yes’ vote on the question of whether the parties should submit the territorial differendum to the International Court of Justice (ICJ). At the end of Friday’s fiery debate, 16 members of the ruling United Democratic Party (UDP) voted ‘yes,” thus carrying the vote; while 9 members of the Opposition People’s United Party (PUP)—which was far more vocal in the debate—voted ‘no.’ There were 5 members of parliament absent and 1 suspended – that is, Cayo South area representative for the PUP, Julius Espat. “We all know why the UDP government is proposing this amendment,” said Opposition Leader Johnny Briceño, in kicking off the debate. “They actually are under a lot of pressure from Guatemala so that both countries can hold their referendum over Guatemala’s unfounded claim over Belize, so that they can take it to the International Court of Justice,” the Opposition Leader added. Briceño opined that, “…Guatemala will hold no referendum.” “They have been begging for US$50 million from the international community to finance the referendum, and all indications are that they are not going to get it,” he added. He also pointed to the breakdown in diplomatic relations with Guatemala marked by that country’s recall of its ambassador to Belize in early 2016 and Guatemalan aggression at the Sarstoon River, Belize’s southern boundary with Guatemala. Briceño said that “the Guatemalans are pretty much strong-arming our portion of the Sarstoon River…” by barring Belizean military and civilians from moving freely up and down the river. He also pointed to continued incursions by Guatemalans into Toledo and Cayo. Briceño said that the time has come to set up a national team of the best experts to be able to deal with this matter, and that team “can come up with a comprehensive national plan as to how we are going to address the hostility of Guatemala,” which, he said, is not being a good neighbor at this time. Briceño had more propositions: that the referendum on the Belize-Guatemala issue must be binding, and that sections 3 and 7 of the Maritime Areas Act, which he said limits Belize’s claim to territorial sea, must be repealed. The Opposition Leader said that he does not have a problem with reducing the threshold for a referendum to just a simple majority, but when it comes to the Belize-Guatemala differendum, this is of such national importance, since it deals with the sovereignty of the country, that he believes that Belize should keep the threshold at 60%. “Until we can get the commitments from the other side, we are unable to support amendments as proposed today,” the Opposition Leader concluded. Stann Creek West area rep for the PUP, Rodwell Ferguson, said that he hails from one of the districts from the south which Guatemala is interested in – the Stann Creek District, home of key industries, such as citrus, fisheries and banana. “Going to the ICJ, Guatemala will come back with something,” he said, suggesting that Belize could lose a portion of Toledo. The Opposition member for Toledo East, Mike Espat, said that the Maritime Areas Act and the 3-mile limitation is the reason why Guatemalans are coming so close to Punta Gorda. Espat said that the Guatemalan military travel right next to Orange Point when they come with their patrol boats. Foreign Affairs Minister Wilfred Elrington, the UDP member for Pickstock, said, “This is a dispute that has been simmering for 60 plus years.” He said that on 21st September 1939, Guatemala purported to reject the 1859 boundary treaty, and since that time, we have been having problems. With regard to the change in the Referendum Act which Parliament was being asked to consider, Elrington said that there was no contemplation that the requirement for a referendum vote would be any other than a simple majority. “Every advanced democracy in the world uses a simple majority and that is the norm when we have the general election,” Elrington said. “This amendment will stop no Belizean from going and voting. Every Belizean should go and vote…” he added. Urging national unity rather than division on the matter, Elrington said that whatever happens, it is not going to affect only some of us but all of us. “We are in the same boat; all of us will go down… like the Titanic, we will all go down,” Elrington commented. Fort George representative for the Opposition, Said Musa, who was Prime Minister when the Maritime Areas Act was passed, with the support of the UDP, said that Elrington went out of his way to try to antagonize the Opposition side of the House, although they were urging Opposition support for the bill. He said that the UDP rose to power on the promise that it would repeal the Maritime Areas Act—but it remains on our law books. Musa said that the act was intended to achieve a negotiated settlement with Guatemala but since no such solution is in sight, Parliament should amend section 3 to ensure we enjoy full territorial rights up to the median line and also to amend section 7 to ensure Belize enjoys its full exclusive economic zone (EEZ) rights under the United Nations Law of the Sea (UNCLOS). He said that this should be a precondition for us to go into any kind of referendum—simultaneously with Guatemala or separately—so that the world should know and so that if it ever should reach the ICJ, Belize would be on a better footing. He also underscored the need for the ICJ referendum to be binding. Musa went on to point out that voter reregistration is long overdue – in fact, he said, 20 years overdue, since the last exercise was carried out in 1997. “It is foolishness to have redistricting before reregistration,” he said, pointing to the stance previously taken by the UDP administration. The PUP’s Toledo West rep, Oscar Requeña, said that he represents 28 communities in Toledo, and together with Espat, they represent 56 communities in that district, including some which are along the Belize-Guatemala border. He underscored the need for there to be a comprehensive education campaign on the matter—nothing “wishy-washy,” he said—so that Belizeans can be aware of the pros and cons of going to the ICJ. Cordel Hyde, Lake I area rep for the PUP, said that the Foreign Minister is suffering from a blindness of hope, pointing to what he said is litigation risk that would be attendant with taking the matter to the ICJ. “How can we believe him when he sa ys the ICJ is the panacea and the justices will give us a permanent solution?” Hyde questioned. He also suggested that the Government of Belize should immediately engage an international marketing consultant to get Belize’s message out, as Guatemala has been giving Belize a black eye all over the world. “If they can get their message in the BBC, for sure we can get our message in the New York Times,” said Hyde, pointing to the need to engage the tens of thousands of Belizeans living in the USA in attracting international media attention to the issue. In wrapping up the debate, Prime Minister Dean Barrow, UDP member for Queen’s Square, addressed the salient concerns from the Opposition. Barrow challenged the PUP’s view that Belize has compromised its maritime entitlement. “That is not how I understood it,” he said. As for the Referendum Act proper, Barrow said that he wants to disabuse the Opposition with respect to the notion that the passage of the amendment is in order to hasten holding of a referendum on the ICJ. He said that since there was the decoupling of the provision that required countries to hold simultaneous referenda on the ICJ issue, as far as he is concerned, Belize is not holding its referendum until Guatemala holds theirs. He said that if Guatemala were to trick Belize into going first and we say ‘no,’ they will have the moral high ground; it would be easy for them to push us to go first so we appear to be the bad guys. “I don’t care who urges a different course of action. Let them go first,” Barrow insisted. “You can’t go except the majority of Belizeans so determine in a referendum,” Barrow underscored.